Rebecca graduated from American International College with her Doctorate of Physical Therapy in 2013. Her clinical experiences included orthopedic outpatient, sub-acute, and geriatrics with special interest in vestibular therapy. She participates in continuing education courses regarding current vestibular therapy evaluation and treatment. 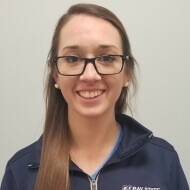 In 2018, Rebecca became OCS (Orthopedic Care Specialist) certified, reinforcing her specialty in orthopedic patient management. She also has a special interest in concussion treatment and management. Rebecca played softball through college which has propelled her interest in sports medicine and post-operative rehabilitation of all ages. Rebecca enjoys staying active by participating in multiple softball leagues and going to the gym. She also loves to follow a variety of professional sports, especially hockey and baseball.